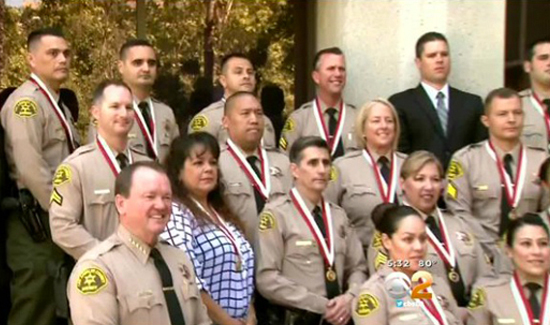 Dozens of people working for the Los Angeles County Sheriff’s Department and a U.S. Forest Service firefighter were honored this week for helping save lives through their heroic actions. Sheriff Jim McDonnell and other dignitaries were among those presiding over the 2015 Lifesaving Awards Ceremony. There were dozens of compelling stories of officers who went way above and beyond to serve and protect the citizens of Los Angeles County. Several stories were highlighted at the ceremony, but one in particular involved seven deputies and two sergeants from the department’s Palmdale Station. Sergeants Richard Cartmill and Paul Zarris, and deputies Joana Gomez, Adrian Guillen, George Hanley, Dennis Miller, Travis Ogle, Scott Sorrow and Erika Wilts were honored for their roles in rescuing two teenagers and their mother from a potential hostage situation in January of last year. VIDEO: Dude, Where’s My Horse?